B6 Road starts not tto far in from the Spillway Road that crosses one end of Blue Rock Dam out of Moe. The track starts easily enough being reasonably flat. Not too far in is the first steep descent with some rocks and rutts. A few more bends and there is a river crossing ( Bull Beef Creek ). 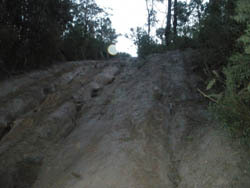 The entry into the creek is okay, but exiting in this direction is very steep, muddy ( in the wet ) and rutted. The creek itself is approximately 500 mm deep. From there, the track winds it way to Mount Carmel Road.